Do you know where the coffee you drink at our cafes comes from? Continuing on with our Coffee 101 series (Part 1. Growing Coffee Around the World), we’re looking at how our organic coffee farmers actually harvest the coffee beans that we love. 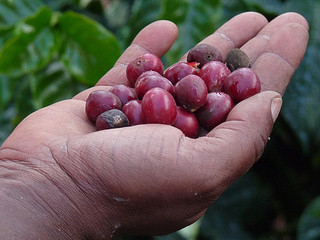 You’ll recall from our article on growing coffee that the actual coffee beans are inside of what looks like red cherries on robust-looking plants grown in tropical climates at high altitudes. How do you actually get the coffee beans off the plants? Our organic coffee farmers-suppliers get right up to the coffee plants and carefully hand-pick the cherries only at optimum ripeness. (Wait — how do you know when they’re ripe? The cherries will be bright red, glossy and just a little bit soft if you squeezed them in your hand). 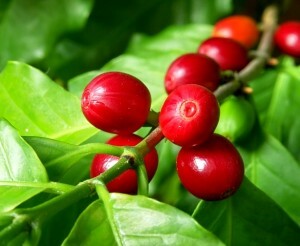 How does the ripeness of the cherry affect the taste of the coffee? Coffee processed from ripe cherries is naturally sweet and shimmering with floral and fruit notes. Coffee processed from unripe cherries may taste grassy, green, thin, or astringent. Coffee processed from overripe, shriveled cherries (sometimes called raisins) runs the risk of tasting fermented, musty, or mouldy. As you might imagine, this can be a labor-intensive process that takes a lot of time, even if you’re dealing with a relatively small coffee plantation. On the other hand, it’s the only sure way to make sure that each batch of coffee beans is going to deliver the flavour you want, without any waste. Good things come to those who wait, though. We use hand-picked coffee beans from our own coffee suppliers in Colombia, Brazil, Ethiopia and beyond. It’s the harvest method we like best! To be sure, this isn’t how we would do it, since you get the best quality coffee beans from hand-picking. But for the big operators, you’ve got two methods: strip harvesting and mechanical harvesting. For strip harvesting, the coffee farmer strips all of the cherries off the plant at once. Calling it ‘hand-picking’ would give the wrong impression, since this method of harvesting doesn’t discriminate between the ripe and unripe cherries. All of the cherries fall onto cloths, along with leaves and twigs torn off in the process, where the coffee farmer attempts to sort the ripe cherries from the unripe ones. The end product may be slightly more inconsistent, but for the farmer, the benefit is getting the harvest done quickly. When you get really big plantations, the corporations tend to turn to mechanical harvesting methods. 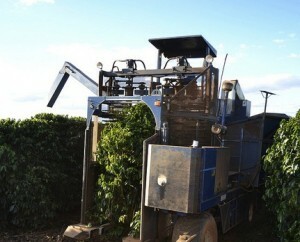 Machine harvesters literally shake the coffee cherries from the plants. Alternatively, they could use brushing machines to scrape the cherries. Again, this tends to yield a lower-quality product than hand-picking — which is why we like to keep it small and simple! 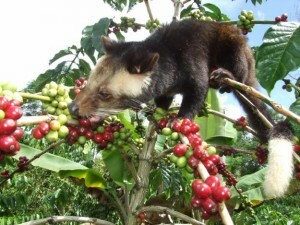 What about this Civet Coffee I’ve heard stories about? Those stories are true. Some of the finest coffee drunk anywhere in the world goes through a unique harvesting process. The Asian palm civet (which looks sort of like a cross between a domestic cat and a monkey, though it is in fact a cat) eats the coffee cherries right off the plants in Sumatra, Indonesia. The civet will choose only the best quality and optimally ripe cherries to eat, helping naturally select great beans without the need for human intervention. The animal poops out the coffee beans that undergo beneficial chemical changes thanks to enzymes in the cat’s digestive tract. Since the coffee beans are already off the trees, it’s left to the coffee farmer to collect the, er, product, off the ground. The coffee beans are cleaned, roasted, and the coffee that’s served has a smoothness and flavour you don’t get anywhere else. It’s also the priciest coffee in the world, at upwards of $20 per kilo, depending on demand! What happens after the coffee beans are harvested? The coffee farmer has to pulp the cherries by squeezing them to separate the actual bean inside from the pulpy fruit on the outside. They soak the beans next to remove any pulp that remains (The beans sink to the bottom of the water while the fruit floats at the top). Then the coffee beans are dried, collected, packed and shipped off to coffeehouses all around the world — to be served to you, our loyal customer. Know that every batch of roasted coffee we serve has been hand-picked to offer the finest quality coffee for you to drink!